Ezrin is known to be involved in intercellular interactions, and a shift from membrane-bound to cytoplasmatic protein expression has been associated with malignant potential. This association has primarily been demonstrated in cell lines and, as yet, little is known about the distribution of ezrin in primary benign and malignant breast tissues. We have, therefore, set out to investigate ezrin protein expression in a series of primary breast lesions. 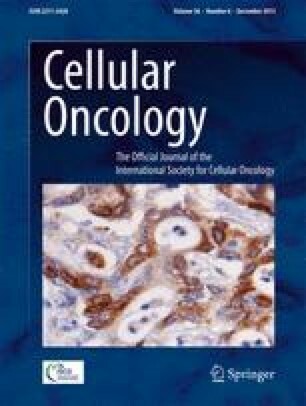 Immunohistochemistry was used to detect ezrin expression in 465 samples of normal breast tissues, benign breast tumours, pre-invasive breast lesions, breast cancer tissues and metastatic lymph nodes, and the protein expression patterns observed were correlated with clinicopathological parameters. Ezrin was detected in the cytoplasm of both benign and malignant breast tissues, but its expression was significantly higher in the malignant tissues (13 % vs 60 %, p < 0.0001; χ 2 test). We also detected a statistically significant higher ezrin expression in pre-invasive lesions compared to benign lesions (15 % vs 44 %, p = 0.04; χ 2 test). We did not find such a difference in ezrin expression between pre-invasive and invasive cancer samples, nor between invasive cancer samples and lymph node metastases. Within the group of invasive cancer samples, we found a significant correlation between ezrin expression and CK14 (rs:0.38, p < 0.007) and Her2 (rs:0.25, p < 0.002) expression. No such correlation was observed between ezrin expression and nodal status, grading, patient’s age, hormone receptor status, and Ki67 or p53 expression. Taken together, we found that cytoplasmatic ezrin expression increases from benign to malignant breast tumour development. We hypothesize that the tissue architectural alterations that are associated with aberrant ezrin expression may point at pathophysiological mechanisms that may be instrumental for the design of novel therapies.